This unique rock earns its nickname from the "ears" sticking out from the top. 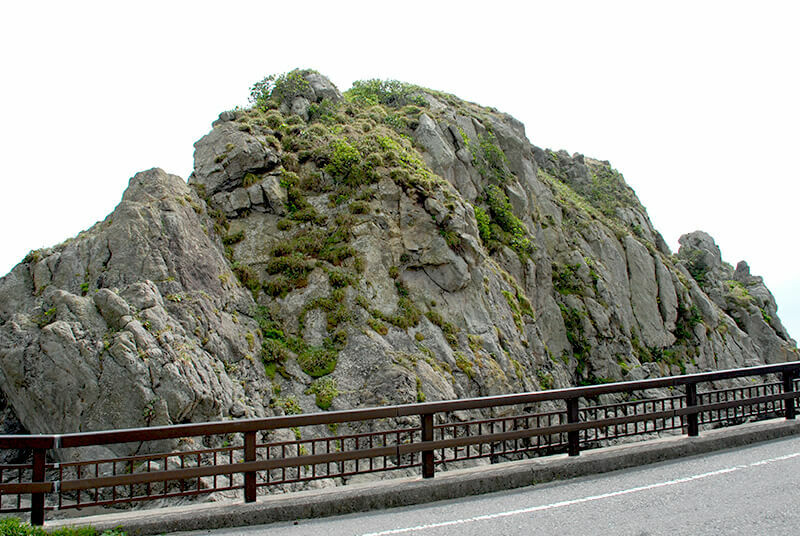 The area where the rock is situated is known as Inu Waka, named after Wakamaru, the faithful hound of Minamoto no Yoshitsune, an important figure in Japanese history. According to an old legend, the warrior Yoshitsune was forced to leave Wakamaru behind when fleeing Choshi after a battle. The dog is said to have howled for 7 days and 7 nights, turning to stone on the 8th day. 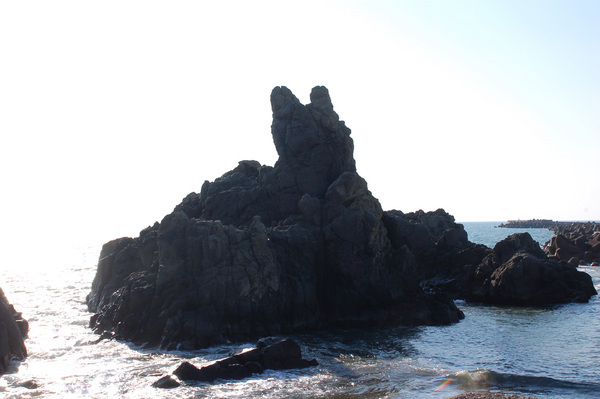 His howls were reported to have been heard from the easternmost tip of the Choshi peninsula which is why that area is now known as Inubo, or "Howling Dog" Cape. At nearby Tokawa Port there is another large rock known as Sengaiwa. It is said that Yoshitsune hid his knights here. Over 200 million years old, the rock was part of a famous sightseeing course as far back as the Edo period. Take the "Choshi Dentetsu Line" from "Choshi Stn". and get off at "Tokawa Stn". Approx.20 mins walk from "Tokawa Stn". When you come out of Tokawa Station, walk straight down towards the sea. Walk down the hill until you come to Tokawa fishing port. Turn right and keep walking along the quayside until you see the Choshi geopark sign. Take the next turning left and you'll see the rock. Take the bus bound for "Nagasaki" from "bus stop #5" at "Choshi stn". and get off at "Inu Waka bus stop". Approx.10 mins walk from the "Inu Waka bus stop". From Inu Waka bus stop. Cross the road and walk down the hill towards the sea. Turn right at the T junction. After about 100 meters, you'll see the Choshi Geopark sign. Ask the driver to take you to "Inu Iwa". Free to visit at any time.